PEPperPRINT: New PEPperCHIP® Lupus Microarray available! Systemic Lupus Erythematosus (SLE) is a multisystem autoimmune disease with mild to severe symptoms including a red rash, swollen joints and lymph nodes or chest pain. Although the suspected causes for SLE range from environmental triggers to vitamin D deficiency, a common serological feature is the production of autoantibodies. 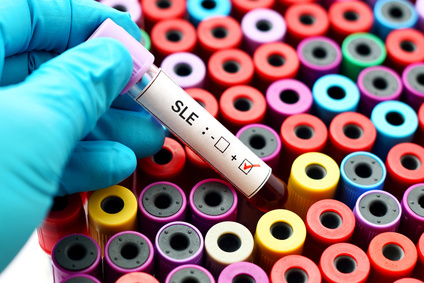 Despite a relatively small set of autoantibody targets, there is neither a single marker nor a marker panel used as a gold standard in SLE diagnosis. For a better understanding of SLE-related autoantibody responses, we developed the novel PEPperCHIP® Lupus Microarray. The high density peptide microarray covers28 lupus antigens translated into overlapping peptides for a highly multiplexed epitope mapping and 761 lupus epitopes of the Immune Epitope Database. The PEPperCHIP® Lupus Microarrayfurther contains epitopes with posttranslational modifications like citrulline and acetyllysine as well as the corresponding unmodified peptides as controls. The PEPperCHIP® Lupus Microarrayenables the correlation of SLE -specific IgG, IgA or IgM autoantibody responses with pathogenesis, the search for differential antibody responses on the epitope level and hence the discovery of new prognostic SLE marker peptides. For more information on the epitope content of the new PEPperCHIP® Lupus Epitope Microarray, download the material data sheet as well as the microarray layout scheme on the product website.